SirenSeaSA came through with clams from Washington state this week. We'd just had shrimp with linguine the night before so I couldn't really make Clams with Linguine, my go-to dish for clams and/or mussels. This recipe is based on one I found in The Spanish Table cookbook using whatever I happened to have around rather than following the original (Amêijoas na Cataplana) to the letter. I got some Bilboa chorizo from their shop in Berkeley with the rest of the ingredients coming from our pantry and garden. We got ours from SirenSeaSA's amazing subscription service but any good fishmonger should often have them available. They will usually be sure that all of the clams they sell you are alive but you should check again when you are ready to cook them. Store them in a colander over a bowl covered with a damp paper towel in the refrigerator until you are ready to use them. Don't keep them in water, don't let them dry out, and keep them refrigerated. They will not store long - try to buy them the day you are going to use them to be safe. If you have purchased farmed clams, they likely have already been purged, probably best to ask the fishmonger whether they have or not. If you are purchasing or fished for wild clams and are not sure, google references to see how to purge. Check each one is alive as they should be closed. If you see any that are not closed, *lightly* tap those that are not with another clam. If it is alive, it will close shut; if it remains open, discard it - it's dead and inedible. As long as the clam was alive just prior to cooking, it won't matter if it doesn't open in the pan; it should still be edible. A good-sized cataplana would be ideal to cook this dish in but a large skillet with a cover should work as well. We have a cataplana but since it would be too small for this I went with a wok. Heat a skillet/cataplana over medium heat. Add the olive oil, and when it is hot, add the sliced onion and bay leaf. Cook gently until the onion is soft and translucent. Add the diced chorizo to heat well. Add the chopped tomato, sprinkle the pimenton on top, stirring to combine. Pour in the wine, season with a pinch of salt, stir all together, and bring to a simmer. Add the clams, cover and cook for 10 minutes at which point all of the clams should have opened. 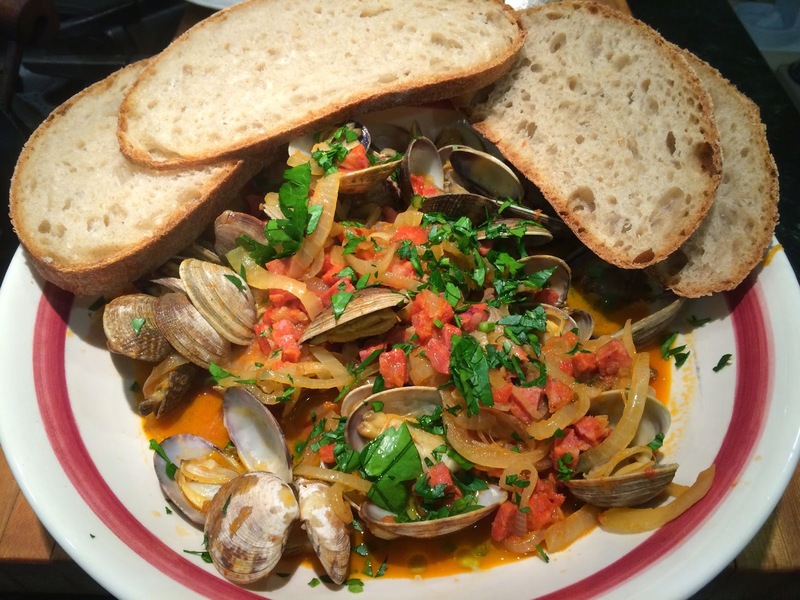 Remove the cover, plate the clams with the sauce, sprinkle the chopped parsley on top, and serve with crusty bread to soak up the sauce.